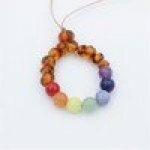 A beautiful Chakra necklace that will entertain your baby while breast or bottle feeding! 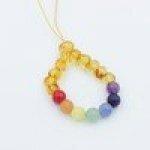 Mom can wear this necklace and baby can play. There are seven zones of energy, or function, within the body. Purpose: Feeling of being grounded, safe and secure. Purpose: Feeling beautiful, connected and purposeful.